In June I started using the bike for work. The highveld temperatures were dam low and despite being wrapped up well I couldnt keep my fingers warm. Even though I wore THREE pairs of gloves... I could have bitten my fingers off when arriving at work and felt no extra pain. Ive always considered heated clothing was for woosies but this winter changed the opinion. The only heated gloves I found in SA were R1450 a pair so I decided to make my own. I found an article on the net using BEADALON as a heating element. 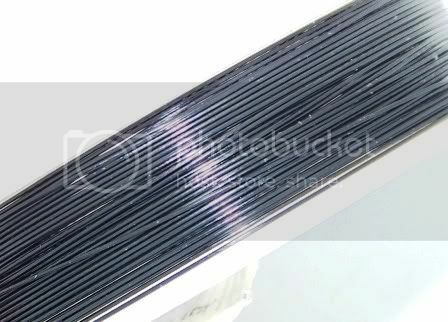 Beadalon is stranded stainless steel wire with a nylon coating, its used by schoolgirls to make necklaces. Hmmm. Just a word of caution... the Beadalon wire is not intended for use as a heating element, the manufacturer provides no electrical data for the product. Use it at your own risk. What is needed to make the gloves. 1. A pair of cotton work gloves, mine came from Mica, they had some rough looking gloves in the safety equipment section and some very soft and warmer types in the gardening section. Mine came from the gardening section. 3. Some specs about the wire... its 0.46mm dia, each reel contains 9.2meters, it is made up from seven fine strands of stainless steel with a nylon coating for (electrical) insulation. 4. Four meters of 0.22mm stranded copper wire, this is used to connect the Beadalon to the bike. 5. 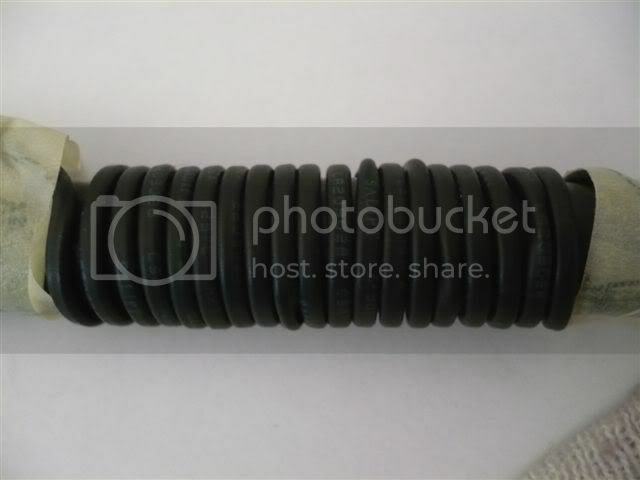 Four bootlace wire ferrules used to make a good connection to the stainless steel wire. 6. Two meters of heatshrink tubing, this needs to be just wide enough to take two pieces of the 0.22mm wire. 7. 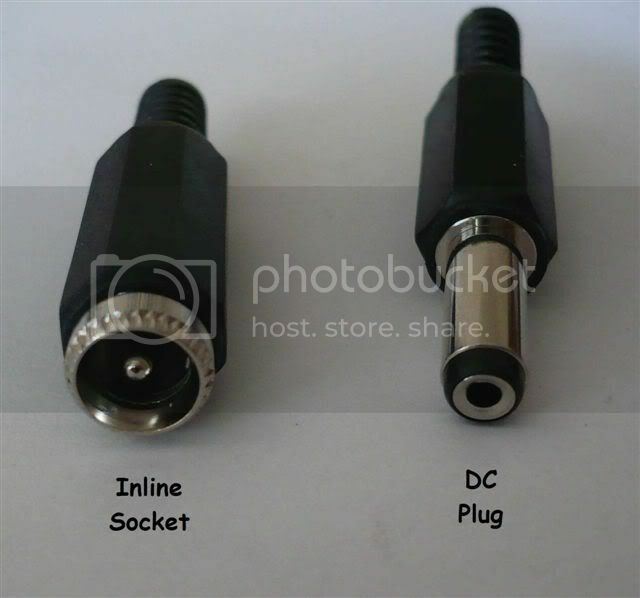 A pair of DC plugs and inline sockets, these are the connections between the gloves and the bike. 8. Two meters of 0.5mm red and black wire. This connects the bike battery or electrics to the DC sockets on the handlebars. 9. Fuse holder and fuse..this is VERY IMPORTANT, DO NOT OMIT !!! A soldering iron with a fine point. A mulimeter to test everything before use. First of all, here are my gloves. Looking at the specs of commercially available gloves, they used heating elements producing between 10 to 15watts of heat. Seven strand Beadalon wire has a resistance of approx 19.13 ohms / meter. The bikes electrical system operates at 13.8 volts. A single 2m piece of wire will have a resistance of 38.26 ohm. Therefore 13.8v 2 / 19.13 = 4.97 watts, lets call it 5 watts. Two strands will produce 10 watts. Any bike should be able to handle this extra load on its electrics. Cut the Beadalon into 4x 2meter lengths. Remove 5mm of the nylon covering by burning it off with a cigarette lighter. Gently clean the exposed wire with a little fine sandpaper. Separate the wires into two pairs and fit both wires into a crimp at each end. Next job is to sew a pair of wires onto a glove. My first attempt had a single loop of wire running down the edge of each finger, it worked OK but could be improved. My next pair will zigzag the wire along the top of the finger, then return the wire along the inside of the finger and start the next. This should distribute more heat into the fingers where it is needed. 1. Do not allow the wires to cross, the insulation will rub off and cause a short circuit. 2. It is best not to route the wire under the fingers or on the palm, this prevents the insulation wearing off plus most off the heat is needed on the top to counteract the wind chill cooling. 3. Tie a small loop in the wires at the start and end, this can be stitched to the glove to prevent the wire being pulled. 4. Terminate the wires at the right side of the left glove and the left side of the right glove, this makes routing of the wires to the handlebars more ergonomic. Next thing to make is the spiral wires to the handle bars. It would be nice to buy these off the shelf; I was unable to find any so these were also home brewed. 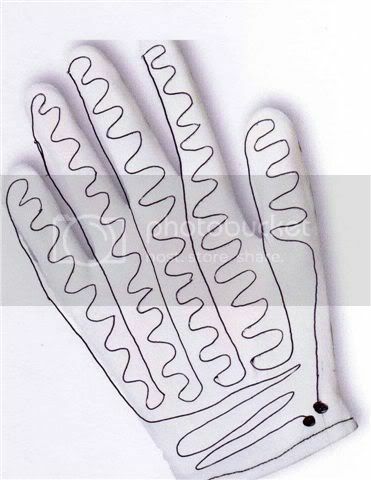 Cut 5cm off the heatshrink tubing to insulate the connections on each glove, the remainder is cut into two equal lengths. 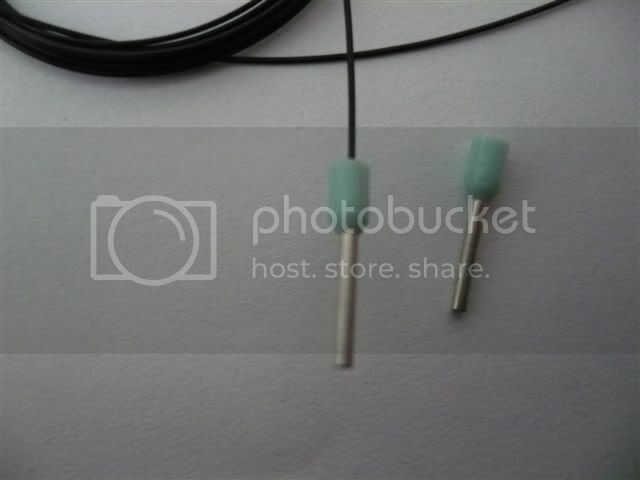 Two pieces of the 0.22mm wire are threaded through the tubing and leave about 5cm protruding from each end. Tape one end of the heatshrink to a piece of plastic pipe (mine was approx 15mm dia), then wind the heatshrink around the pipe and tape the other end to the pipe. Next use a heat gun or HOT hairdryer on the heatshrink. It will contract and when cooled take the shape of the plastic pipe. Repeat for the second piece of heatshrink. You now have a homemade pair of two core spiral cables. The next step is to connect the cables to the gloves and plugs. Cut one end of the wire in the spiral back to about 2cm from the heatshrink. Strip the insulation off and tin the wires. Next cut the crimps back a little on the ends of the Beadalon and tin them. When they are cool slip a 1cm piece of heatshrink over the wires and solder the wires to the crimps. Slip the heatshrink over the crimps. Next securely stitch the 3cm of the spiral lead to the glove, the final job is to fit the other end of the spiral leads to the DC plugs. Take care when soldering the wires in the plugs, there isnt much space, make sure the wires are secured to prevent being pulled out. 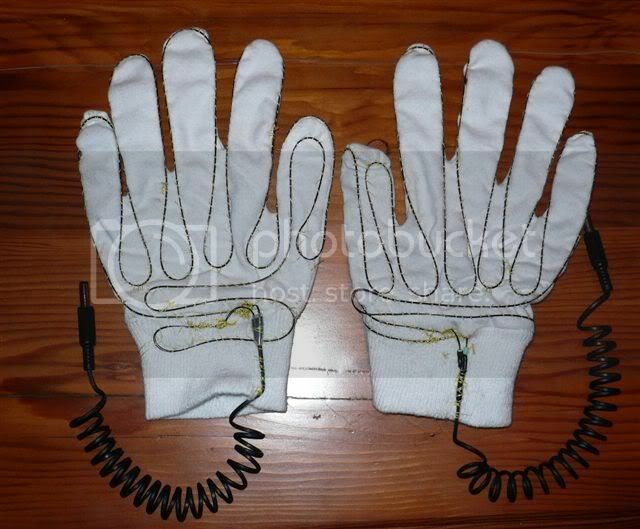 You can test each glove with a spare battery or possibly a battery charger. Connect the glove with a 2amp fuse to prevent any nasty surprises. Connect the red / black wires to the inline DC sockets, make sure the red wire connects to the center pole of the socket. Pass the wires through the PVC tube, the tube is to provide extra protection for the wires. 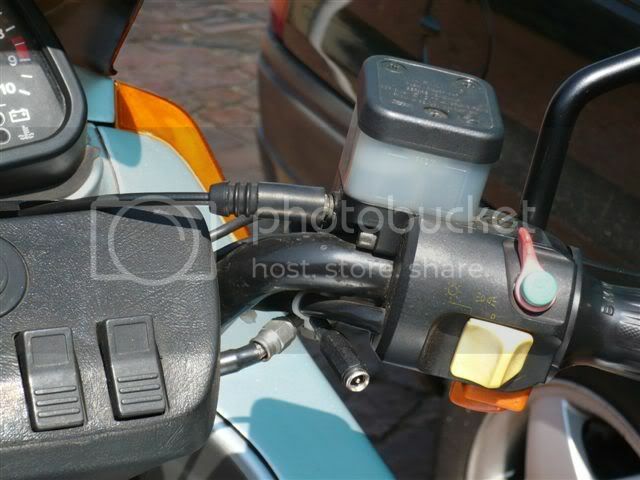 Strap the wire/tubes to the handlebars and routr to the battery. An alternative place to connect the +12v is from the live side of the starter relay. Join the red wires from each handlebar to the fuse holder, tape it well and possibly strap it to an existing piece of e wiring harness. The other side of the fuse holder is connected to the +12v side of the battery. Join and tape both black wires and connect them SECURLY to a ground point on the bike frame. VERY IMPORTANT bear in mind the wire from the battery to the fuse holder isnt protected from short circuits, it is important to keep this wire as short as practical. Before next winter Ill make a MK II version, more heating wire will be stitched on the fingers. The two pieces of heating wire produce 0.05watts / cm, so its easy to calculate where the is generated. Last but not least.. If anyone needs more info..PM me. Excellent write up I agree. You can buy the kits here and I have succesfully sewed one of these into my BKS summer liner with good effect. I think the finer stranded wire will be good for the gloves. I have returned a pair of Gerbing within 3 weeks as the wire must have broke inside. The new pair have done a few months but I only wear em if it's gonna be really cold and I'm out for more than 1/2 hr as they are not very comfy IMO and I wonder whether they will last. Gerbing stuff has lifetime warranty on the wiring anyway, but it's a pain sending stuff back and cost postage. I am a big user of heated gear having used a Gerbings waistcoat without problems for around 15 years. I use some curly wire (like a kettle lead) then you get a bit of warning before it starts to pull the wire out.